Sea ice loss North of Franz Josef lands top, more than 100 km between May 17 and May 29 2016, May 17 is the photo with less sea ice. mobility or lack of cohesion, entirely due to warmer temperatures and the collapse of thinner sea ice , usually the "glue" slowing or keeping the pack more consolidated. This sort of movement always normally occurs in August or late July. This graph may indicate a larger colder area over the main pack, the more open water changes the over all analysis. It would be preferable to have a similar Graph covering surface temperatures 85 latitude Northwards. WD May 29, 2016.
drop below Astronomical Horizon (AH) if top of sea ice was warmer than surface air. In many years of observations it was never observed doing that, the much lower sea water horizon observations with colder than sst air were never repeated with ice. Instead spring sea ice horizons maintain AH until evening or until under sea ice melting is 24 hours a day. This likely happened yesterday, South Cornwallis Island looking at westward MW Passage. May 19 2014-2015-2016 Horizon comparisons (left center right). 2016 was taken 40 minutes later same date, but with horizon at AH. While 2014 and 15 rose above and kept on rising, despite cloudy conditions, whiter streaks are breaks in clouds sun ray reflections. The rising horizon 2014-15 was created by cooling of air accelerated by minima top of sea ice core temperature. 2016 core appears warmer, if not significantly out of cooling potential. but during spring the AH horizon lasts a few minutes when it first shows, in March or early April, so accretion keeps on making net gains. AH horizons gradually become longer, but when AH is maintained more than 12 hours, the bottom of sea ice melts more than forms, net bottom melting occurs. This has happened yesterday, when AH was observed 1 hour before the midnight sun. For the first time I have observed this in May, this makes Spring 2016 fast ice the weakest heat resisting sea ice observed since 2010 when spring observations have started. While taken at same evening time, the same 19 May Ice horizon appeared at different altitudes. 2015 (left) kept rebounding upwards, while 2016 remained steady so 1 hour prior the midnight sun. Sea ice bottom accretion has stopped in 2016, and now bottom daily melting has started. 85 to 90 N NOAA Reanalysis. May 16, 2016. Use the mouse pointer to compare surface and top of sea ice temperatures. Remote sensing VS Refraction Prime sea ice rule. Satellites are pretty good, but refraction observations are better. ~ Is likely some remote sensing calculations/methods need some adjustments. Taking advantage of persistent "Big Blue" of 2016 spring, a truly remarkable insolation bombardment , the right term "relentless" onslaught of sunshine, we can check and find if refraction gained insights (written here) are true on a planetary scale. NOAA daily climate composites are very good, so we look at its sea surface temperature setting or "surface skin" temperatures VS surface temperatures. NOAA May 4 2016. Daily mean surface temperatures "1000 mb" temperatures are too cold in East Siberian and North Barents seas, North of Ellesmere and Greenland surface air 1000 mb is largely too cold. There is a strange North of Wrangel Island surface air cold area spot and also compared to entire Chukchi Sea surface temperatures. Basically if I am correct, Remote Sensing surface temps algorithms daily means appear to have a mixing problem with land features. Note Surface temperature 1000 mb Ta is indeed always warmer than top of ice Ti well away from land. Click on GIF image to expand and use your mouse pointer to make comparisons. NOAA May 1-5 2016. Composite mean makes it much harder to find Surface air 1000 mb air colder than top of sea ice. 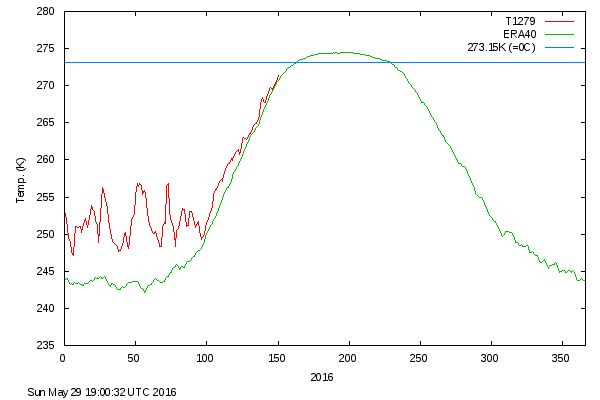 The North of Wrangel Island temperature anomaly most likely was from thicker sea ice pressure height temperature difference. Although, North Barents Sea has still a smaller area of colder air especially East of Franz Josef Islands. Hypothetically, the longer we average out the likely Algorithm error, the more impossible it would be to find Ta < Ti. warmer than surface air 1000 mb temperature. NOAA surface temperature looks better but still has small daily flaws. May 9, 2016 NOAA daily composites offer surface air temperature feature which performs slightly better than 1000 mb, if you click on extreme cold surface air temperature near land it will be likely erroneous, making surface air colder than ice. Which has never been observed optically. April 9-May 9 average If you find a spot where Ta< Ti , let me know. There are none I can find.